Drain piquillo peppers; arrange on paper towels to dry well. Drain tuna; transfer to a bowl and flake finely. Add mayonnaise, olive oil, capers, shallot, parsley, lemon zest and juice, mustard, and garlic to tuna. Stir to combine, then season with salt and black pepper. Transfer mixture to a resealable plastic storage bag. Chill until close to serving time. Before serving, snip the corner of the bag and pipe mixture into each piquillo pepper. Arrange on a platter. Sprinkle with additional parsley. 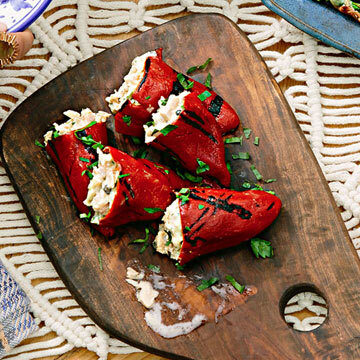 *Shopping Tip Find Spanish piquillo peppers at specialty stores such as Whole Foods or online. Or just skip them! The filling is delicious as a spread with crackers (and you can even add some minced ordinary roasted red peppers, if you want, for color and flavor).